As we have seen the different way of wedding such as wedding in the air during sky diving, under water wedding in ocean during scuba diving, wedding in the highest peak of the world, Mt. Everest during expedition any many more unique ways to cherish the moment for lifetime. The traditional vietnamese wedding is one of those experiences to gather. As mentioned earlier, wedding customs in Vietnam vary according to ethnic groups and we have tried to cover all most all different tradition as follows. 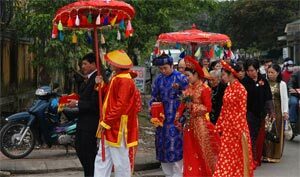 Wedding customs in Vietnam vary according to ethnic groups. The traditional weddings in remote village weddings, they are very simple for very rich in culture. Silk Road Group makes your wedding and anniversary arrangements in Vietnam an unforgettable and affordable experience. Our wedding packages are organised to suit your dreams and desires. With personalised service will help you to custom design your wedding and anniversary plans. 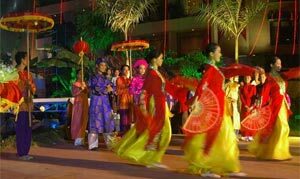 Our comprehensive wedding coordination team will ensure your wedding day in Vietnam will be truly unforgetable. The vietnamese wedding ceremony consists of two parts. on the first day the groom with his parents and a small group of family members or friends-goes to the bride's home to seek her parents' permission to marry her. often, the groom presents the traditional offering of betel leaves and areca nuts to the bride's family. after the groom has made this formal proposal of marriage, the bride's family makes a similar request to its ancestors at the family altar. on the second day, there is a celebration after the bride and groom performed certain rituals at an altar set up for the occasion. On the day of the ceremony, all the groom's family have to go to the bride's home on time because they chose the good time some months ago. The traditional gifts include betel and areca-nut, cake, and fruit. Then, the groom and the bride worship at the altar of ancestors. Next, the bride puts the ring onto the bride's finger, earrings into her ears, and a necklace onto her neck. The cost of jewelry depends on the groom's finances. The bride also puts a ring onto the groom's finger. A wedding banquet is scheduled in the evening at a hotel or a big restaurant. It is always a delight feast that all relatives, friends, and neighbors are invited. A music band is usually hired to play live songs. At the banquet, the groom, bride, and their family are once again introduced to the guests and everyone will drink a toast. Dinner will be served at the tables. During the reception, the groom, bride, and their parents will stop by each table to say thank to their guests. The guest in return, will give envelopes containing wedding cards and money gifts to the newly wedded couples along with their blessing. A lot of weddings nowadays are followed by a dancing party, which is opened by the groom and the bride's first dance. The party does not recess until very late at night. The newly wedded couples then leave for their honey moon. In conclusion, after the party, the bride belongs to the groom's family, and she will live with the groom for the rest of her life if nothing wrong happens to their life!! Please Just tell us as much as you have in mind: your special desires, your budget, how many days, the destinations you prefer, how many people in your group, what kind of rooms, and any other special requirements. Our travel consultants will help you to make the most of your travel time and your affordable amount. You will get our email response within 24 hours.